Miss Appear – From SpongePedia, the biggest SpongeBob-wiki in the world! Miss Appear is a superhero who is seen in the episodes Mermaid Man and Barnacle Boy V and The Bad Guy Club for Villains. She is part of The International Justice League of Super Acquaintances. 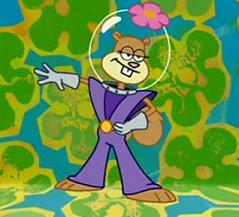 She is Sandy's alter ego. She has the ability to become invisible or visible. Her costume is a purple suit. Barnacle Man, Man Ray and the Dirty Bubble fear her the most. Invisibility and visibility; she can disappear and appear as she pleases. Despite her name, she does the opposite. Her name is a play-on-word of disappear. Miss Appear is a parody of Fantastic Four's Invisible Woman. In The Bad Guy Club for Villains, she is in her first episode of MM and BB that SpongeBob and Patrick watch on their TV, though she is not Sandy's alter ego in the episode. This page was last modified on 4 April 2018, at 21:08.